I’ve written articles for this blog about quake putty, which you use to stick things down non-permanently that you don’t plan to move, and about how some items just aren’t practical to stick down, like TV remotes and cats. However, there are items that you need to move around occasionally but not very often. 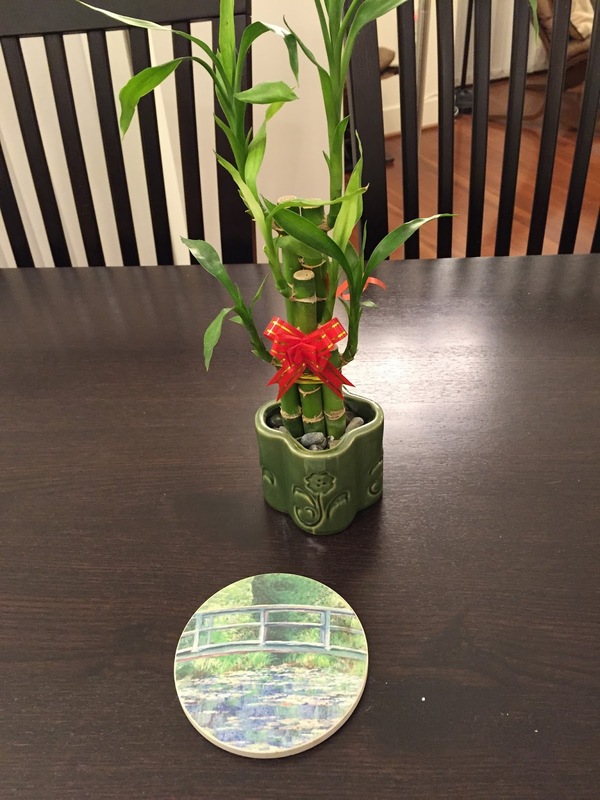 Here’s an idea about how to at least hinder those items from slipping off of surfaces. 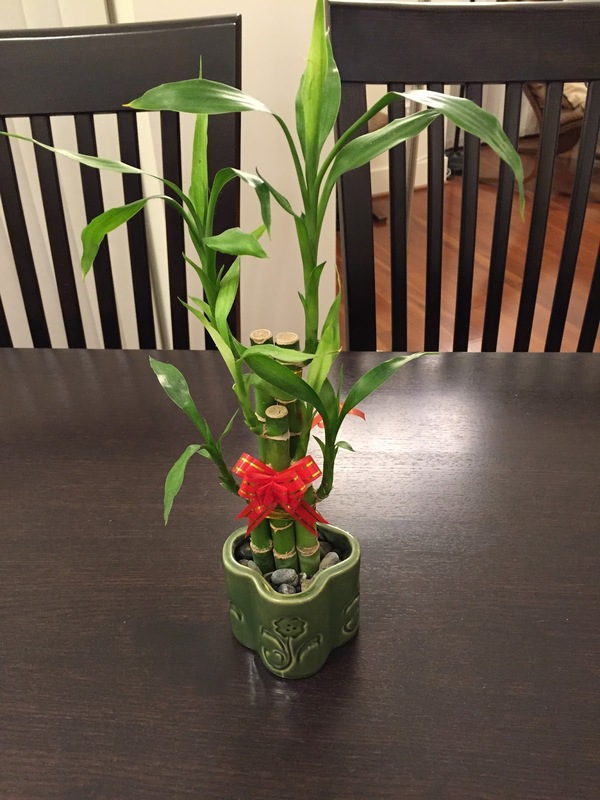 My specific example: a little ornamental bamboo that I like to have on my dining room table. 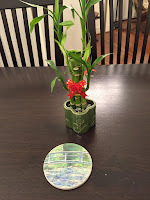 It COULD be stuck down to the surface with quake putty, but it gets in the way if I’m having people over for dinner and want the flexibility of moving serving dishes around on the table without having an unmovable plant right in the middle. 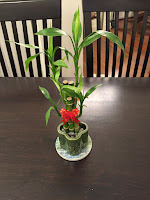 Updated paragraph: I had initially thought that this plant was not toxic to pets, since bamboo shows up on the ASPCA list of plants that are toxic to pets, as non-toxic to dogs, cats, and horses. 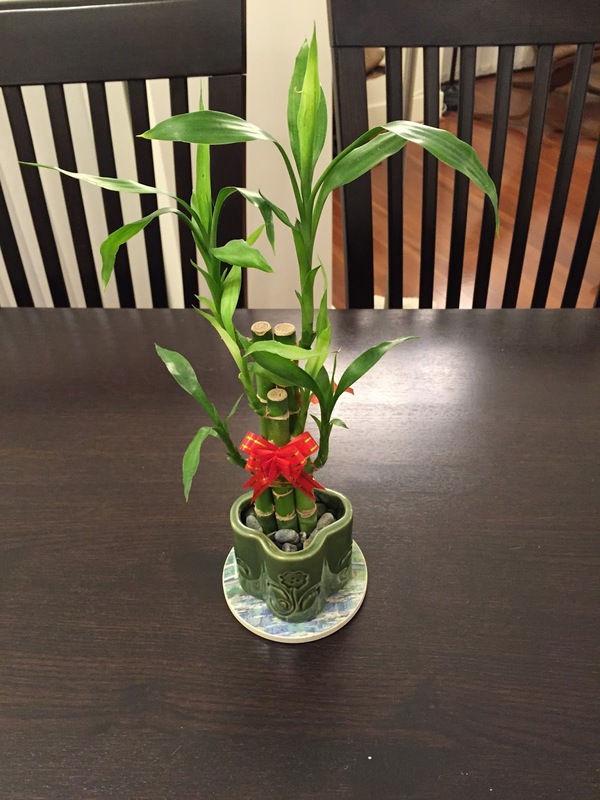 However, it turns out that this "lucky bamboo" is not bamboo at all; it's a completely different plant, Dracaena sanderiana, that DOES show up as toxic to dogs and cats (thanks to my sister for pointing that out). So if you think your dog or cat might try to eat this if it were on the floor, this plant may not be the best example. Even if your dog or cat isn't the type to try eating something like this, if you could at least discourage that little rock-filled ceramic pot from sliding off the table in an earthquake, then there would be one less thing to hit them. The first thing I did was to stick it to a coaster with quake putty, to make the base wide enough that I don’t have to worry about it tipping over. All it could really do in this state would be to slide off the table. Then I looked around for something tacky that would limit its ability to slide. There are little rubber feet that you can get in the hardware stores, but they are small and meant to go under corners. I wanted something to cover the entire bottom surface of the coaster. 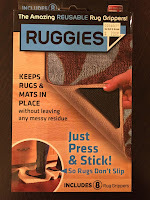 I had some “Ruggies®” left over from when I needed to stick down corners of area rugs that kept sliding around. These are pieces of an amazing polymer that is extremely sticky, but if you peel it off, there’s no glue or any coating; it’s just a property of the material that it wants to stick to things. 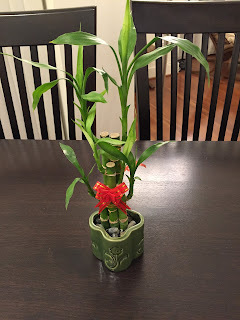 I thought that would be perfect, but it was too good, and if I wanted to slide the bamboo over, I had to make a major effort to pry it off of the table. Feeling a bit like Goldilocks and the Three Panda Bears, I looked around for some kind of rubber that would have great friction without actually being sticky. I figured that silicone would be perfect, but it wasn’t straightforward to find a silicone sheet. I stumbled across one today in the hardware store without even looking for it. They had different versions of a truly amazing product (I have no financial ties to that or any other use of silicone) that was a lid that you just put on top of a bowl and it forms an airtight seal, which had enough vacuum that it would not come off but was easy to remove if you lifted one corner. 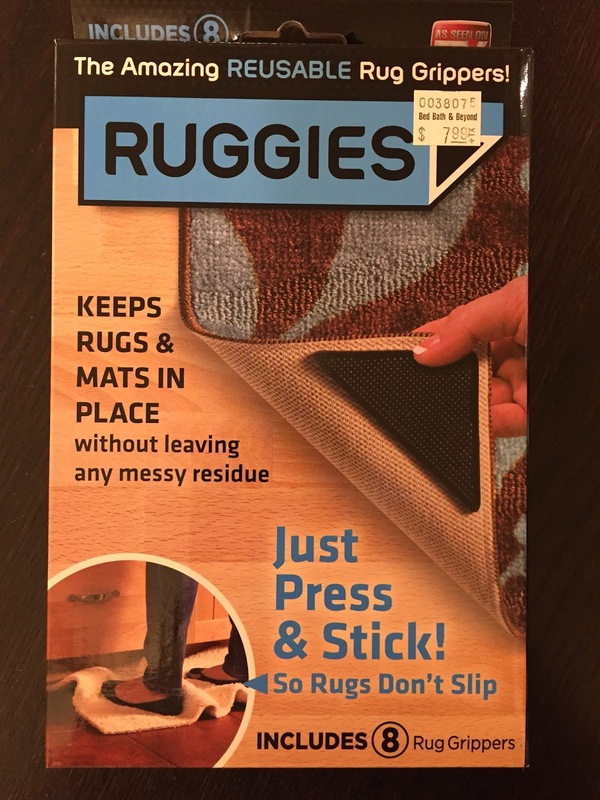 Amazing product, but I purchased it so that I could bring it home and destroy it! I cut a circle out of it slightly smaller than the diameter of the coaster, so that the randomly colored silicone wouldn’t be visible. Many of these products are textured on the top, which wouldn’t be ideal for sticking it to the bottom of the coaster, but I found one in which the top texture was very minor. 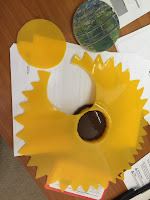 I cut a circle of the right size and was then ready to stick it to the bottom of the coaster, when I discovered something not very surprising: it’s really difficult to stick something to silicone. Quakehold putty slid right off. I rooted through my drawer and pulled out what I considered to be the three most likely candidates in the absence of really understanding the chemistry involved: Krazy Glue®, silicone cement (like aquarium sealant), and Shoe Goo®. I took extra trimmings of the silicone sheet and tried to glue them to the main part of the sheet that I hadn’t used. As you chemists have probably already predicted, the Krazy Glue didn’t stick at all. The Shoe Goo also peeled right off; actually slid right off. The silicone cement, which it would make sense to hope that it would stick to silicone, surprisingly did not bond to it; in fact, the silicone sheet even seemed to inhibit the silicone cement from curing. I’m sure various people will have their own favorite ways of sticking things to silicone, but my solution wasn’t far from where I started: I discovered that even though Quakehold putty didn’t stick well to the silicone, the similar product Amazing Stuff (also called Quake Secure; same product), which is a bit gooier than Quakehold Putty and stretches more like chewing gum, stuck quite well. You can see in the video clip* above how Quakehold Putty (left) and Amazing Stuff (right) compared in their adherence, and I think the other two clips* (below) are pretty compelling, showing how easy it was to slide the plant on the table before and after my little intervention. And so I introduce the concept of leaving objects moveable but skid-proof, as a compromise. This is just one suggestion. Most products marketed to be anti-skid that I tried weren’t really practical for this application. Perhaps those little pads you put on your car’s dashboard to hold cell phones might work, haven’t tried that; it might be like the Ruggies example above. Others, like rubber sheets that you use to grip and open jar lids, only exert friction when you press on them. Whatever you use, it’s best if it is very thin or else it will change the appearance of the item. If you have your own alternative ideas, feel free to post them in the comments field for this article!